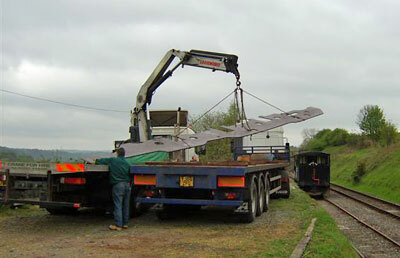 82045 frame plates being unloaded at Eardington on 23rd. April 2007. Whilst we may have been somewhat low key publicity wise for a while, this is in sharp contrast to behind the scenes activity for we are delighted to announce that we now have the two main frame plates for the locomotive. 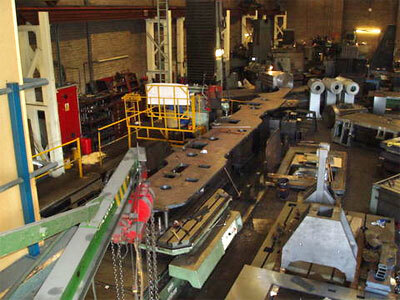 Corus Plate Profiling Centre in the West Midlands have provided the steel plates cut to shape from the BR drawing and at the time of writing these notes the plates are receiving some machining work at J.A.Y. Engineering (Cradley) Ltd. in the West Midlands. These frame plates will shortly move to the Severn Valley Railway where initially they will not be available for public viewing. However plans are afoot to move them in due course to an area where they may be seen by the public. We have spent approximately £10,000 on this phase of the construction of 82045. Thanks are due to the members who responded to our appeal before the end of 2006 for the finance for this activity and to Corus, J.A.Y. Engineering, and the Severn Valley Railway for their help and co-operation. With the frame plates in existence we can now set our sights on the next phase, subject to a large injection of finance. This will involve construction of all the frame stretchers, smokebox saddle, buffer beams, horn guides and horn stays. Before all these components can be brought together to mate up with the main frame plates the latter will require drilling. Additionally, there is the creation of leading and trailing driving wheels and axles to consider together with six axleboxes for all driving wheels. We understand that another new build project has recently had six new driving wheels cast at a cost of £60,000. Add to this tyres, axles and machining work and it is easy to see why steam locomotive engineering is a good exercise in spending large amounts of money. At last, though, we now have something literally on the ground to confound the sceptics and show everyone that we mean business! A press release is due to go out to the four main hobby magazines this week and we are hoping that they will feature it prominently in their respective forthcoming issues. The story will be accompanied by an impressive photograph of the frame plates at J.A.Y. Engineering's premises, which the company has kindly sent to us. We are hopeful that this major step forward towards the building of 82045 will bring us lots of new support and are very anxious to capitalise on our new “head of steam” and press on with the next phase of the project. We are most grateful for the generous support of those members who responded to the appeal for finance in the Newsletter No. 5 supplement, winter 2006. The results of their generosity are already there for all to see. Please carry on supporting us! Every little helps and we are delighted to receive any contributions, no matter how small. One relatively painless way for us to build up our resources is to set up a monthly standing order and if every one of our steadily growing core of members were to contribute monthly, according to his or her means, we would very soon build up some healthy financial muscle! Have a word with Chris about this if you like. His email address is below and he can be contacted on 01928 787255. Any other bright ideas will also be welcome. Make no mistake about it, we are utterly determined to succeed in this project and we can only do so with your help. We were present at the Warley Model railway Exhibition at the NEC, Birmingham in front of 80079 with our colleagues from the Severn Valley Railway at the beginning of last December. We were also in attendance at Bridgnorth on the occasion of the Severn Valley Railway members and shareholders weekend in late March to air our project. Chris and Tony attended the Spring meeting of the BR Standard Loco Owners Group at Haworth at the end of March. The afternoon meeting followed a ride behind 80002. One BRSLOG member has had patterns made for the Gresham & Craven mark six graduable steam brake valve and is ready to go into production of this item subject to a minimum order for ten units. The price per unit is forecast to be between £800 to £900. The class 3 tank engines originally were fitted with the mark four version of this valve but unless one is a “pedantic rivet counter” we see no reason why a mark six could not be fitted to 82045 if this is the economic option. Any sponsors? We were also notified of an item of brake rigging suitable for a class 3 loco made in error for another standard class, but again some additional funding is required at present. Finally as ever we would be more than just delighted to make the acquaintance of a sponsor for a new boiler. The next meeting for members and potential new members of The 82045 Steam Locomotive Trust will be on Saturday 4th. August 2007 at 2.30pm upstairs at Kidderminster Railway Museum. We look forward to welcoming as many of you as possible.